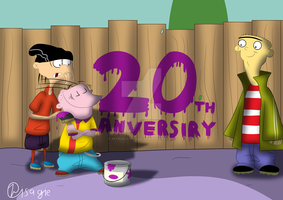 "For 20 years of Ed, Edd n Eddy since January 4, 1999"
For 20 Years of Ed, Edd n Eddy since January 4, 1999! Bingo! I got 300 favorites in 22 days! I remember the first trailers for the show. You mean when Sarah had a dog and the lawnmower was chasing them? The dramatic description of a jawbreaker, followed by one rolling around before Ed shouts "JAWBREAKER!" and the three of them chase it. Nope. The second one, that was the one I was talking about. Yes, that ed. Not double d, nor eddy. I have always loved that show. Too bad there hasn’t been a complete series set for DVD for it. I would get it in a heartbeat. For me that series and The Powerpuff Girls are my favorites show from the old Cartoon Network. Cheers for 20 years of Ed, Edd n Eddy since January 4, 1999! Cheers for 20 Years of Ed, Edd n Eddy! Happy 20 years Ed Edd n Eddy! Yep, it's been 20 years of Ed, Edd n Eddy since January 4, 1999! Awesome! I got more than 180 favorites in 22 hours before 24 hours! Damn. This show made me. Seriously, I learned how to talk thanks to this show. Though it made people think I was autistic. I feel like I'm about to cry. Bingo! I got more than 160 favorites in 19 hours before 20 hours! All Right! I got 150 favorites in 17 hours before 18 hours! Yes! I got more than 100 favorites in 11 hours before 12 hours! awesome work and happy birthday Ed,Edd n Eddy!!!! Cheers for Ed, Edd n Eddy! 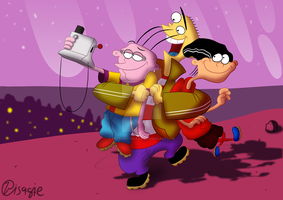 happy 20th anniversary Ed Edd n Eddy wish cartoon network would've given this series a complete collection by now but then again cartoon network stopped caring about this show a long time ago outside of the double d cameo from ok ko cartoon nexus. Happy 20 years, my old friends! (Whistles) Ed, Edd n Eddy! Happy 20th Birthday, Squiggle Lined Ed Boys.